The oil industry remains remarkably male-dominated, with comparatively few women coming through the ranks to hold critical positions and wield influence. 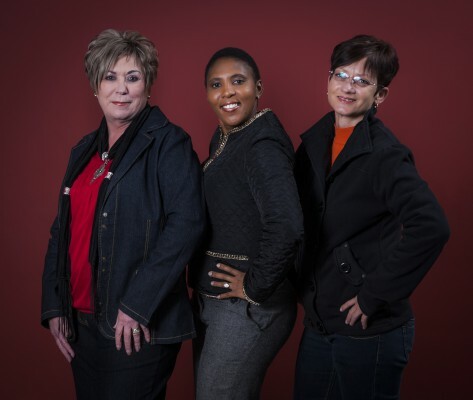 Bucking the trend, leading fuel company Engen Petroleum channels considerable investment into female leadership development, making the task of profiling its women leaders positively easy. By no means the only woman in a responsible position in operations at Engen, Nsibande’s role of plant supervisior at Engen’s Johannesburg Distribution Centre involves overseeing manufacturing and distribution of bulk chemicals and lubricants. At the time of writing she had just been made acting depot manager, as the depot manager, Dieketseng Meletse, another female leader on the team was on maternity leave. Marais joined Engen in 1989 and rose through the ranks to her current role, which involves overseeing compliance of the depot with health, safety, environmental and quality (HSEQ) standards and laws. The company’s extensive supply chain sees it manufacture, package, transport, store, transfer and dispense lubricants and chemicals, some of which are hazardous substances. It must therefore comply with a mass of regulations, laws and standards intended to protect staff, the community and the environment. Marais' position is not only extremely sensitive but also central to the company’s operations and public safety. What got her to this key position? Marais credits honesty, communication, commitment, a positive attitude and fairness. “Taking the easy way out is no way to succeed,” she says. Marais' biggest challenge, she says, lies in creating a safe working culture. “My department can’t do it alone. We must inspire others to play their part. It’s very difficult, but patience and persistence win out over time, even if your decisions make you unpopular. To get her mind off the work’s stresses, she finds peace in music and gardening. Tersia van Eeden, Marais’s counterpart in the administrative function of the depot, joined Engen the year before. Their long service record supports the view that oil companies are hungry for female talent and will provide a rewarding work experience for women of value. Subscribing to classic job-defined concepts of leadership, she nonetheless believes life is about taking risks. “We never know what blessings await us until we take the first step. It doesn’t always work out, but then you walk away learning something. Like her colleague, she draws inspiration from family, and acknowledges the recognition and trust of management giving her a platform to excel, trying to pay it forward by being a trusted confidante for colleagues. But it’s not always easy. Forced to turn in a poor performance appraisal for a subordinate, she regained his trust only by explaining that it had not been malicious and was moreover necessary as a starting point for improvement. “Taking ownership of failure builds the foundation for success,” she explains. “Also, never compromise on integrity, moral standards, trust and work commitment,” she adds. Van Eeden sees Women’s Day as a way for women to celebrate their independence, respect their own worth and stand together against discrimination and abuse.